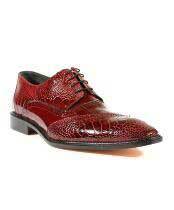 Are you looking for discounts and best price on buying men's classic and traditional red dress shoes? 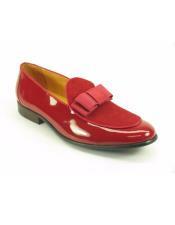 You can now shop for classic men's red colored dress shoes in all shades of red at our online store. 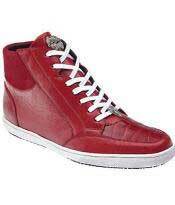 Red and black shoes represent a youthful presence, with trend setting designs ideal for the street and beyond. 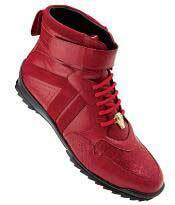 Buy them online now by simply logging on to wwww.mensusa.com. 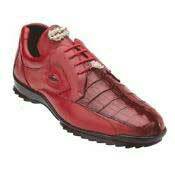 You will find mens red shiny shoes for men for prices as less as $50. 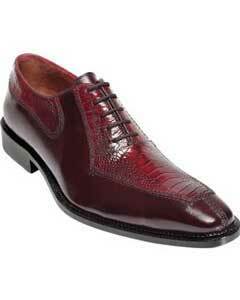 Pick any style, design and shade of mens red dress shoes online for men and buy them at cheap price online. 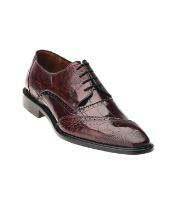 Mens red dress shoes are available in different shades of red like the men's dark red classic shoe, light red sober collection of red men's shoe, and so on. 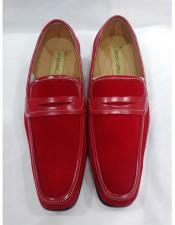 Mensusa has online stock of different style in red dress shoes for men. 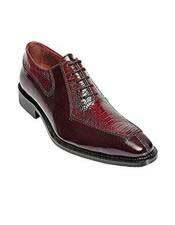 You will find colors like dark red that resemble the maroon shade and lightest red that looks like orange in the wide collection of red men's shoes. 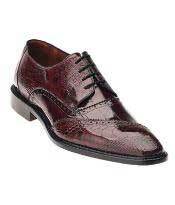 You may either go for a loafer patterned dress shoe in red or a simple classic lace up red men's oxford shoes. Mensusa has them all stocked up for your choice and preferences. 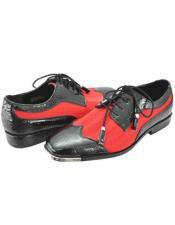 The prices of these men's classic red dress shoes are available with huge discount offers on them. 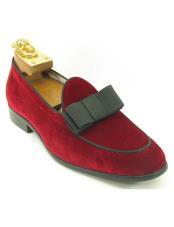 Hence you will never go wrong making a purchase from Mensusa.com. 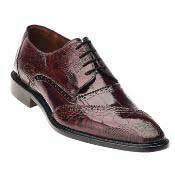 Browse through this category to find amazing shiny red dress shoes with dual tone pattern in them. 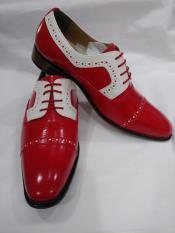 You will find red with white, red with black and many other combinations in dual toned classic red dress shoes for men. 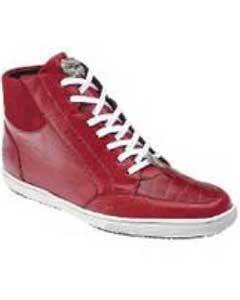 Mensusa is decade's old online specialty store specializing in selling men's apparels online. 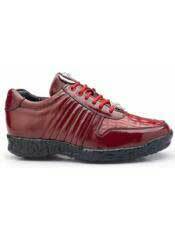 You will find quality products like men's red dress suits, accessories and footwear at cheap and affordable prices online. 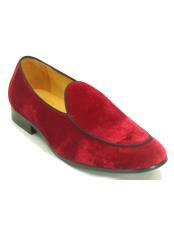 Our collection of men's red shoes comes in different fabrics as well. 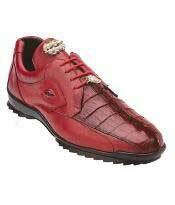 If you are a fan of leather footwear, we have pure leather red shoes stock up just for you. 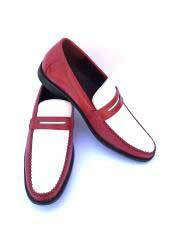 If you are someone who likes variation in terms of style and design, we have classic suede material slip-ons in red that catch the attraction of many eyes in a crowd. 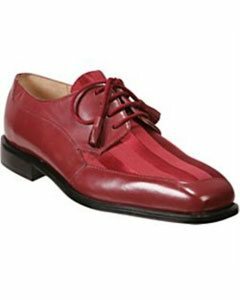 Hence if you browse the red shoes category for men at Mensusa, you are sure to find something that impresses you for sure. 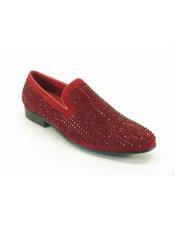 Men's red loafers come with plain design that just looks sober and simple whereas there are other collections of loafer styled footwear for men that come in designer buckle patterns that highlight the overall style and look of the men's footwear. 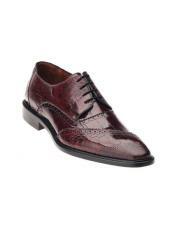 Whether you are a person who loves to keep the style simple and sophisticated, or you are someone who likes to make a bold statement with your stylish footwear, we have all kinds of red shoes and footwear for men that will satisfy your style and choice. Shopping from Mensusa is as easy as it can get. Our user friendly online store assists you in simple steps to make your dream purchase easily and in a hassle free manner. 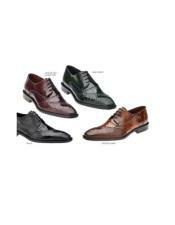 So just log on to www.mensusa.com and start shopping right away!